I have a new Haruka head up on eBay. Click here or on the picture to view or bid. I just love this new reroot. I like to keep it simple and have hair to brush and play with so I don’t usually attempt fancy styles. But it’s nice to have the flexibilty to put her hair up or down. 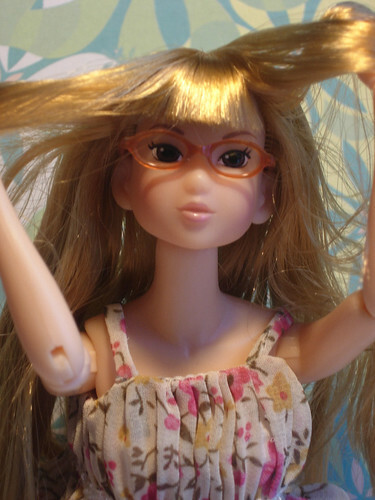 A lot of times when you buy a doll with it’s hair up it’s hiding lots of bald spots. It’s meant to stay in that style but invariably most of us doll nuts like to take their hair down and do something different with it. I just listed another Obitsu Gretel head on eBay. She’s such a pretty face mold. She’d be pretty even for a resin mold. Click here or on the photo to view or bid. 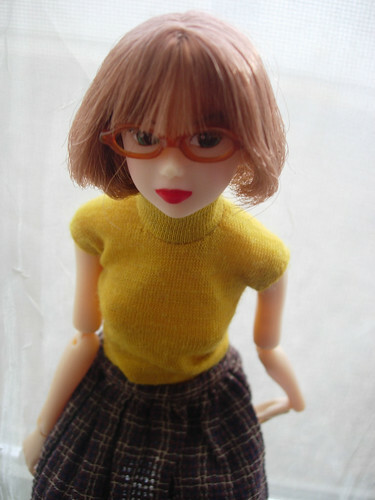 This is sweet choco momoko. I call her Akane because she looks like the character in Ramna 1/2. I’ve listed my Haruka face-up on eBay. Click on the image to view or bid. I went for a more natural look on her and think she’ll look good with lighter hair. Also here’s a sneak peak at my newest obitsu 1/6 sized head. I’m not sure when I’ll be listing her head. If anyone is interested in buying the head before then, I’m asking $50.00 plus shipping. The body can be included for an additional $24 and the shipping costs are the same with or without the body. Click here to contact me. Here we have my rerooted CCS 06SS orange with a newly painted Volk’s dollfie male doll. I just finished him and his head is now for sale on my website . Click here to purchase. 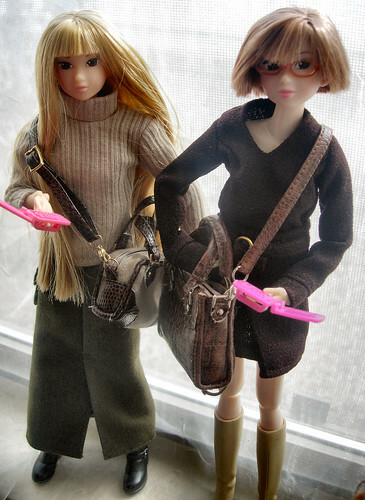 It’s nice to have some males around in the doll world. I plan on doing some more male doll heads pretty soon. 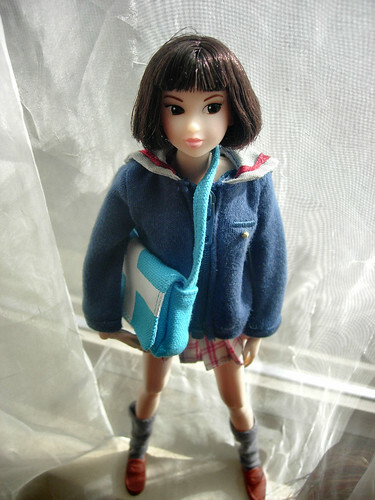 My momoko is wearing Haruhara Haruko doll skooter outfit from the anime FLCL. We just got the boxed set DVD and are enjoying that. I highly recommend it and it has director commentary, outtakes and all that fun stuff. Here is my latest Obitsu Haruka head. I’m waiting on a blonde wig to model her in because I think her coloring will go best with lighter hair. If anyone is interested in buying this head before I put it up on eBay, please contact me. I’ll be putting her up probably sometime this week. Right now I’m asking $65 and it includes the green acrylic eyes. Here’s Goodnight Cherry. She’s wearing some Volk’s WTG separates. I finished the Obitsu Gretel head and have it up on eBay tonight. I love this face mold. It reminds me of Elfdoll Soah. Click here to view or bid. I also finished another Haruka head and I will post pictures tomorrow. This is CCS AW-06 Nervous Lead Lead. So coy, so cute. One of my holy grails of momokos is up on eBay right now- 04ANlw. She’s everyone else’s holy grail too because she’s up to $380.00 right now. So I obviously have to pass on even think of trying to get her. I finished my Obitsu 60cm Haruka head. This is my first face-up on this size and I actually used pastels for the make-up. Some artists use airbrush. I used acrylic paints and then blushed her and eyeshadowed her with high quality pastels and then finished her off with Mr. Super Clear UV flat spray. What amazing stuff that is. I think I’ll use it on my future pastel drawings. Click here to view on eBay!! !